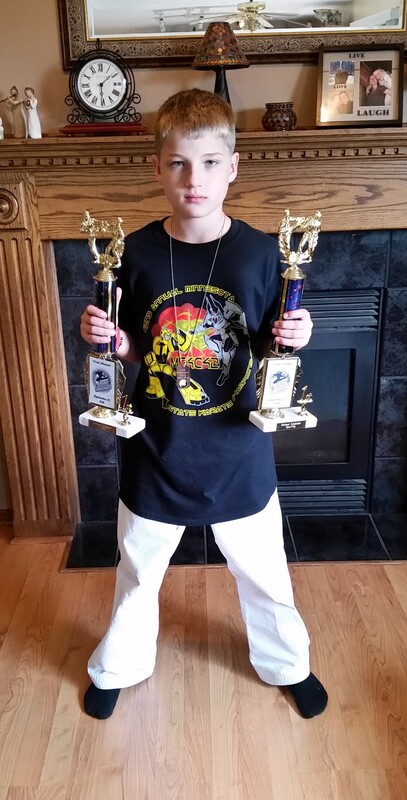 Last weekend, Michael represented Forte’s American Karate in the MN State Karate Championships. It was held at the Earle Brown Heritage Center, in Brooklyn Park, MN. This is a nice venue for the tournament, though the main room isn’t quite large enough for all the rings. There were other areas at the site that held other rings. 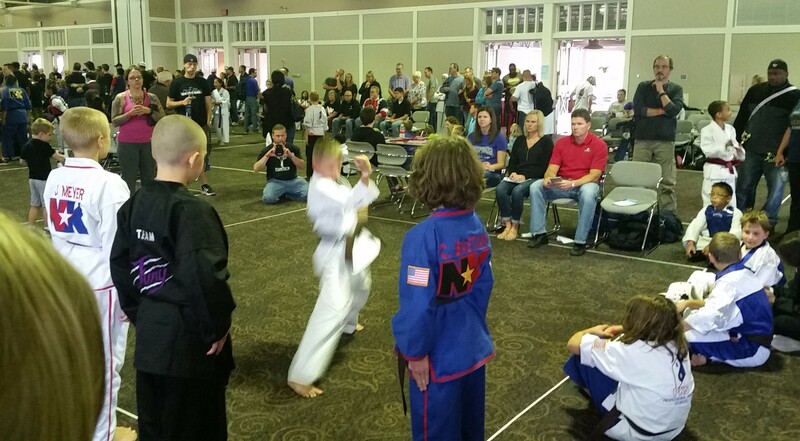 This was the first tournament in this year’s karate competition season. With one season under his belt, Michael was much less nervous than last year! He has since moved up in belts, and is now competing in the 10 year old boys, brown belt division. So far, he is still competing in Open Hand Traditional Forms, and sparring. We’ll see if that ends up changing as time goes on. As all the boys lined up, I couldn’t believe how competitors there were! For both sparring and forms, they had to split the group into 2 rings. I think there were about 17 for sparring alone!! The tournament was run a little different than some of the others we had been to, in that under brown belts went first. Michael had spent the morning watching and cheering on his friends from karate class. Many were competing for the first time, others were starting their second season as well. Overall, his teammates did pretty well. Next, were the brown belts. Because so many had already competed, Michael had some friends standing ringside, cheering him on. I think he was pretty excited about his mini-cheering section, because he did awesome! It was one of the first times that Michael’s name was not chosen to go first in forms. In fact, he was the last competitor in his group to go. There was some pretty tough competition! I guessed him to be about second or third place, though I knew it was probably the best I have seen him ever do it. Then it was time for scoring…. Most of the boys ranged in the 9.94-9.96 range, with one or two 9.98s given out. When it was Michael’s turn to be scored, he got all three 9.98s!!! He knew he had placed on top, as did those of us watching him. A big cheer went up from family members, and teammates! It was very exciting, especially since he’s never placed 1st in forms before! He tried really hard not to smile, but we could see that he was beaming on the inside. Michael scoring 2 points against his opponent. Shortly after forms, it was time for sparring. The boys have to get suited up in all their gear pretty quickly. As I mentioned, they split the boys into two rings. They had them all line up by height. Originally, Michael was the shortest of the taller group (not by much), but when another boy showed up to spar, Michael got bumped to the other ring. 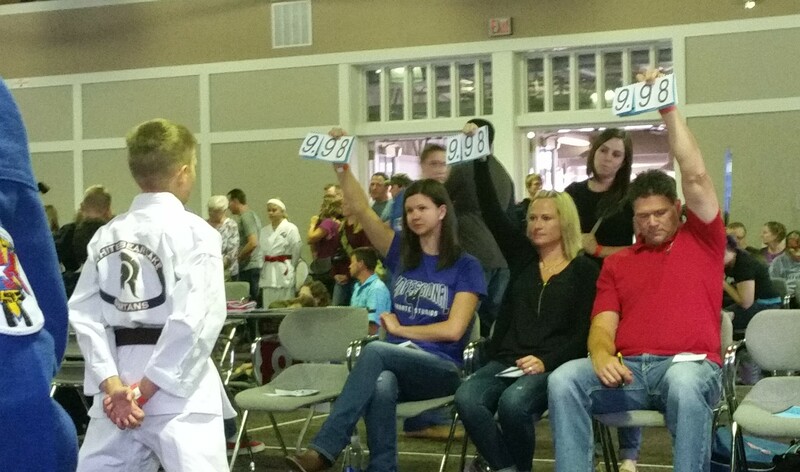 The judges he had in the new ring, were some of his favorites from past tournaments, and included one of his first karate teachers. 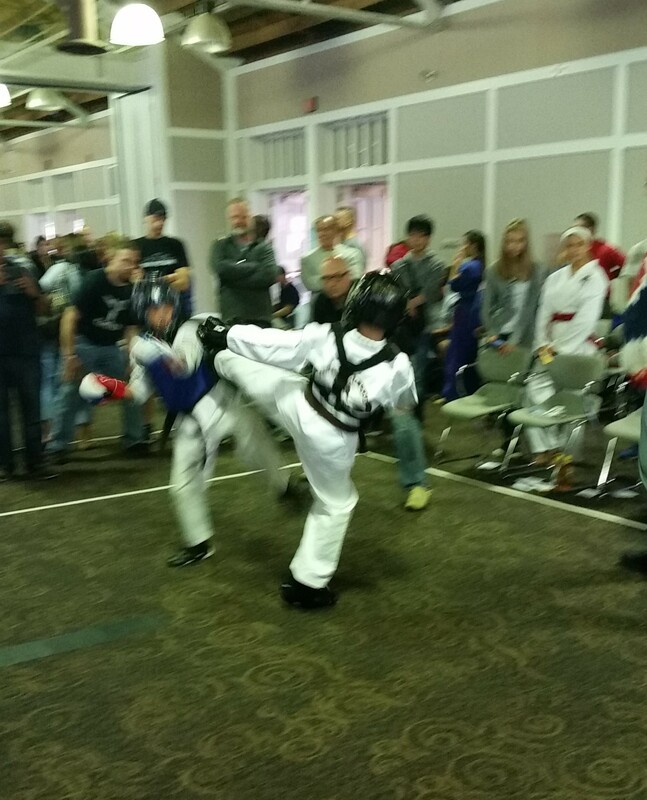 In the sparring ring, Michael was chosen to be in the first match. He had to spar against a boy from Team Edge that he hadn’t been able to defeat before. He was feeling pretty confident after that first place win in forms. He was also pumped up because his karate teachers were done judging for a while, and were watching him. He did great, and won the first match. After watching a couple more matches, he had to spar the winners from those. He won all three matches, and took first overall in sparring! The first tournament of the year in the books, and Michael left with 2 first place trophies… I’d say this tournament season is starting on the right foot! I can’t wait to see how the rest of it goes!